The first classic commercial was for Zoloft. It portrayed people with depression as helpless, sympathetic, black-and-white blobs who were rewarded by chasing the colorful butterflies and bluebirds of happiness (which were Zoloft). Zoloft is indicated to treat adults with major depressive disorder, obsessive-compulsive disorder, panic disorder, and social anxiety disorder. Pfizer’s advertisements featuring the Zoloft blob began running in May 2001. Since then, it has been the most lovable mascot in the depression drug space. In the flagship Zoloft commercial, a groaning, downcast blob trudges slowly through life accompanied by a perpetual rain cloud. The end of the ad shows the blob smiling as he effectively manages his depression. Eventually, the rain cloud dissipates to make way for clear skies and a single dandelion. Then, a blue bird (is that you, Zoloft?) accompanies the blob as it happily bounces down the road. The pursuit of mental balance has never been more adorable. 9 Memorable Drug Mascots, Pharmacy Times, 2/24/16, Allison Gilchrist. Nowadays psychiatrists are strongly admonished not to prescribe antidepressants for people with bipolar disorder. This is totally understandable. As one of my psychiatrists said, he was terrified of my manias and did not want to precipitate one. But in my case it turned out that the depressions were both as severe as the manias and as responsive to medication. I benefited from and eventually needed both. 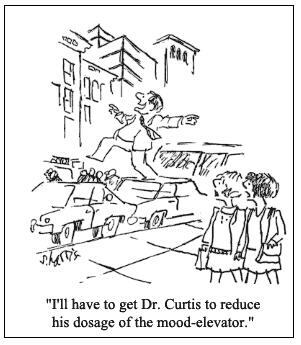 This cartoon shows why psychiatrists are afraid of prescribing antidepressants to those of us with bipolar one disorder. In my experience that is overly conservative. It is possible that I am still alive because my psychiatrist (after letting me suffer for 2.5 years) treated my unremitting depression with an antidepressant. That initial success is not the end of the story, because that initial antidepressant did not work well enough and I went through severe withdrawal. 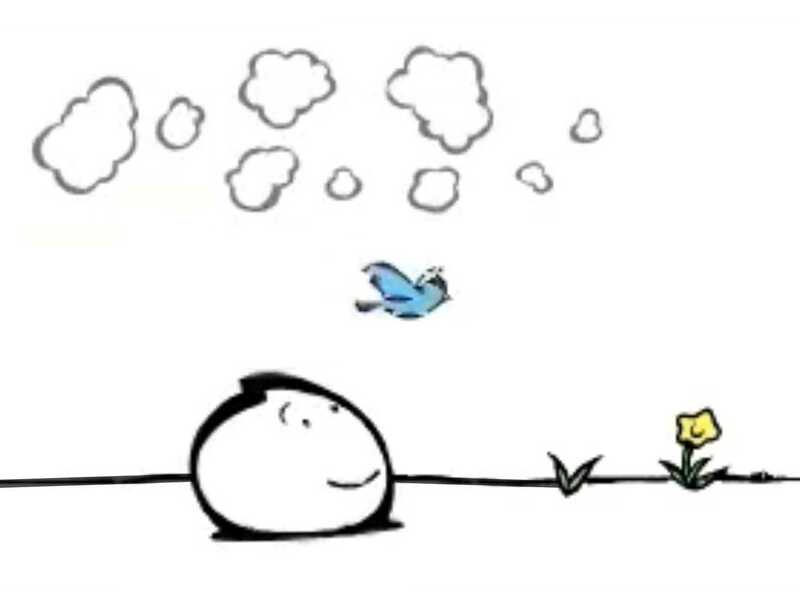 These bluebirds-and-butterflies pharmaceutical companies do not tell you about the fact that many people experience withdrawal symptoms when going off of their medications, because that would seriously encroach on their bottom line. But if you search the Internet you will find many experiences such as mine. But the nonpharmaceutical antidepressants have a much bigger impact upon the depression. For me those were enough, but overall they are more powerful than the drugs. being conscientious about taking my drugs and fish oil, and …? one hour a day of direct sunlight [cheaper here in Colorado than artificial full-spectrum kind]. Get the amount of sleep you need every night, during the same time slot (mine to “lights out by 11, up by 7”, as best you can (get the sleep, with medication if necessary). It is amazing and way too easy to forget, but the quality and quantity of our sleep has a major, direct impact upon depression. Research studies show this link again and again, and speculation is that sleep affects our biochemistry and our circadian rhythms in a very causal way. Poor sleep is also a result of the depression; it is both cause and effect. Be ruthless about getting the appropriate kind and amount of sleep, it is critical. Every day (at least 5-6 times/week) get a minimum of 20-30 minutes of aerobic exercise, preferably outside in nature and in sunlight (sunlight is an antidepressant as well). I take my dog for a walk in the morning. Get out of your house/apartment/hole in the ground. When we are depressed we start associating our depression with the surrounding environment. So just walking back into our hovel we can feel the mood returning, like someone lowering the shutters. Sometimes we need to vegetate, in the house. But make sure that every day you get out of your home and go to a matinée, library, sit in a park, whatever. Work helps but doesn’t seem to count in this regard. I found busier places like grocery stores or shopping malls overwhelming when I was moderately to severely depressed, but there are quiet alternatives. 4) TALK TO PEOPLE THAT CARE ABOUT YOU. EVERY DAY. Get in contact with at least one person each day for personal support. This is much better in person, if at all possible, but if not then on the phone, if not that then on the Internet. But make it a daily discipline, like cod liver oil, to call somebody up and talk about how it is going. Then watch yourself to see how much you resist doing it, because that will give you some feedback about how depressed you are that day. I started going to Alanon meetings when I was seriously depressed for 2.5 years because my depression support group only met once a week. In the Alanon meetings, even though their stories were different from mine, I had the opportunity (the gift, really) to listen to other people who were struggling and surviving, to see in person other people who were sincere and courageous in the face of disaster. It was inspirational to me. Although I did go to church, it doesn’t count in this regard. What you need is direct, intimate contact, from a variety of people (not just one person). You need other caring adults who will listen to your story and tell you theirs — intimacy. You can get this in groups, like support groups, but only in certain kinds of groups, where people are talking honestly about what is really going on with them. The best food for your heart is animals and small (toddlers) children, in contrast with violent movies, superficial crap on the tube, or town council meetings. If no real-life munchkins are immediately available go to the local park and sit near the jungle gym and slide. But it is preferable to interact with real-life munchkins, so offer to baby-sit your neighbor’s munchkins if you don’t have any or take their dog for a walk. Be aware of what you are feeding yourself emotionally, don’t just reach for whatever is on your emotional refrigerator shelf. What kind of books are you reading, do they have an inspirational tone? What kind of movies are you watching, are they upbeat with a positive message? Beware of “meaningful” movies when you are depressed, there is time for them later on but they are a mistake right now. Stay light, upbeat, and joyful. When things were at their worst for me and I had to take a week off work to keep from falling apart, I watched one Disney movie every evening (one of the better ones), and it really was helpful. Pray like you really mean it. Pray again. Pray some more. Pray until you cry. Pray until you’re exhausted. Pray until you have gone through your second box of Kleenex. Pray until you resolve to invest in Kleenex futures. Pray until God starts answering, in your heart and sometimes in your mind. Feed yourself with quality fresh food, an absolute minimum of caffeine/sugar/white flour (anything that plays havoc with your energy cycles), you know the drill. Remember to eat fresh fruits, fresh vegetables, whole grains, and high quality protein. The time-consuming stuff to cook. Avoid fast food outlets, and devote a tithing of your daily physical energy to cooking fresh healthy food for yourself. You don’t need a jerky sugar cycle running alongside your emotional cycle. Good nutrition combats the biochemical aspect of depression. My depression took 2.5 years to get through (it was a particularly intractable one). If I had known at the beginning that it would have lasted that long it would be iffy whether or not I would still be here. So how do you be patient with a living nightmare? One day at a time. You DO NOT have the strength to be depressed for 2.5 years (I certainly didn’t, no one does). But we each DO have the strength to get through today in one piece, with a little progress made. If you keep adding those days on to each other, like building blocks, they will get you to that day when your depression does end. 9) MAKE SLOW, STEADY PROGRESS AT SOMETHING THAT TAKES YOUR MIND OFF HOW YOU FEEL. Keep chipping away at some project while you are depressed. 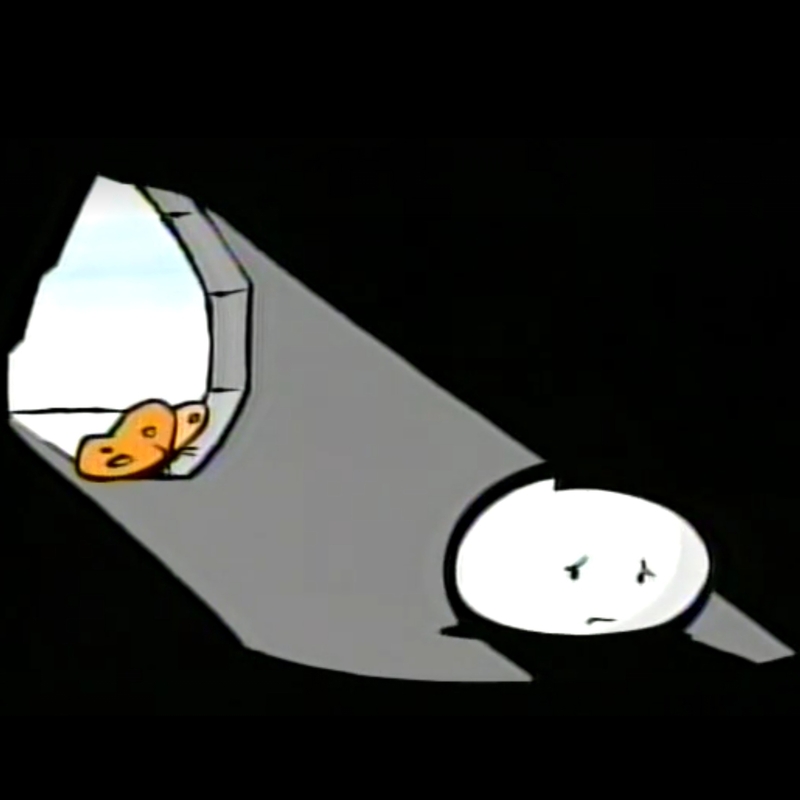 We are talking little bitty chips when you’re depressed, but if you keep at it they add up to something. Do not try to bring out the jack hammer and make major dents. That will just exhaust your fragile energy further and feed feelings of hopelessness and self-pity. Over the 2 years when I couldn’t work or go to school, every week I worked on a major writing project, 1-6 times of an hour or two apiece, depending on how bad I was. I finished it and have it now to show for my depression. Every day I read a few pages in a spiritually inspiring book, not a lot, maybe 15 minutes. Got a lot of books read over those 2 years, books that helped keep me going. 10) STAY ACCOUNTABLE TO A FRIEND WHO HAS COME SURVIVED DEPRESSION. Find someone who has been where you are now, and who is now on the other side. Stay in regular contact with that person, hopefully twice a week and on an as-needed crisis basis. I found a sponsor in a 12-step program (boy was THAT hard for me to do, to admit that a 12 step program had anything to offer me, and wasn’t it the best thing I ever did for myself). My sponsor is a wise woman, a jewel, sharp as a scalpel intellectually, and very generous and caring. She had tried to kill herself through anorexia (and had become very close to succeeding), she had been suicidal, and now is a beacon of hope to people trying to work the 12 steps. SHE WAS (and still is) SO WONDERFUL to me. By seeing her and talking to her I was reminded on a regular basis that she had made it to hell and back — and so could I. Every time she checked in on me and she not only knew the physical, emotional, and mental aspects of whipping depression, but she also knew the spiritual aspects as well. So she would check me out, see how I was doing, and listen to me. Then she would speak to me from her spiritual wisdom and understanding.